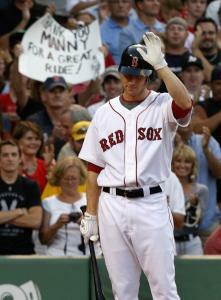 With everyone involved having obtained some sense of "mental peace" in the aftermath of Manny Ramírez's trade to the Dodgers, the Red Sox went about the business of moving on and welcomed the aptly named new guy, Jason Bay, to the Bay State in last night's 2-1, 12-inning victory over the Oakland A's. "Mental peace? Are you quoting Manny?" Sox manager Terry Francona asked in a moment of pregame jocularity. "Well, when we win games, that's when we feel better," Francona said. "That's probably never going to change. We show up every day to win a game, and when we win, we feel better." Francona tried to remind his players of that when he addressed the team before the game. "There's a way to go about winning and we talked about that today," he said. "We just kind of reminded all of ourselves about that today." The message hit home as the Sox battled for 3 hours 50 minutes, rallying with two out in the 12th before a Fenway Park crowd of 37,832 to snap a three-game losing streak and make a winner of reliever Mike Timlin (4-3). This after shipping one of their most productive, if not dangerous, hitters to the West Coast in a trade that netted the 29-year-old Bay. "He doesn't have to be Manny's replacement, quote-unquote," general manager Theo Epstein said before the game. "I don't think that's fair. We're not asking him to fill those shoes, specifically. We're asking him to be a contributing member of a winning baseball team." Bay more than filled that role last night, going 1 for 3 with two walks and two strikeouts and scoring both runs, including the winner on Jed Lowrie's infield single off former Sox reliever Alan Embree (1-4). Bay put himself in scoring position with his first Boston hit, a towering triple that threatened to leave the premises but hit the Wall. "If that ball could've snuck out for me, it would've been better," Bay said when asked if he could have scripted a better debut. "I would've like to have done it in nine innings, because it's been a long day. But it doesn't matter, really. "It definitely ranks up there as one of the better moments I've had." It would've been trumped only by the thunderous Fenway ovation that greeted Bay when he stepped into the batter's box for his first plate appearance in the second inning. The new guy from Trail, British Columbia, drew a walk from Justin Duchscherer (6 innings, 5 hits, 1 run, 3 walks, 2 strikeouts, 1 hit batsman) and was treated to an even greater ovation. "I think he had a pretty good heartbeat going, anyway," Francona said. "This place continues to amaze me. The way the fans welcomed him, you only see that here." When he went to third on J.D. Drew's double to right, Bay made a huge fan out of third base coach DeMarlo Hale by simply obeying his stop sign and not blowing past it, as Ramírez was prone to do. He scored on Lowrie's sacrifice fly to deep left and was greeted by another huge ovation when he crossed the plate, giving the Sox a 1-0 lead. On his next plate appearance in the fourth, Bay reached when he was plunked by Duchscherer. He advanced to third on Lowrie's hit-and-run single to right. Bay was stranded there when Kevin Cash hit into a 5-4-3 double play. Sox starter Tim Wakefield pitched 6 1/3 scoreless innings before giving way to Manny Delcarmen, who finished the inning with a nifty stab of Daric Barton's comebacker to the mound. Jack Cust roughed up Hideki Okajima in the eighth, hitting his 20th homer, a towering shot that bounced off the top of the Wall to tie it, 1-1. Closer Jonathan Papelbon (2 innings, 1 hit, 2 strikeouts) was summoned in the ninth and got out of a potential jam with Jack Hannahan (fielder's choice, error pitcher) in scoring position when Bay made a running grab in left to end the inning. Drew led off the ninth with a single and moved to second on Lowrie's bunt and to third on Jacoby Ellsbury's fielder's choice. He died at third when Dustin Pedroia popped to center. Mike Lowell reached on a two-out single off Huston Street in the 10th, but had to be replaced by Coco Crisp after he pulled up with a right hip strain. Bay, who struck out in his third and fourth at-bats, came to the plate with a chance to win the game and the undying admiration of his new fans, but drew a walk. Street walked Drew to load the bases, but got out of the jam when Lowrie lined to center. Javier Lopez opened the 11th by fanning Carlos Gonzalez but was the beneficiary of some stellar defense by reserve shortstop Alex Cora, who ranged to his left to make a great diving stop of Hannahan's sharply hit grounder. Cora sprang to his feet, then spun around and threw out Hannahan. When Bay made his sixth plate appearance in the 12th, he did not disappoint, ripping a towering shot off the Wall. Lowrie then provided the victory with a single up the middle that shortstop Bobby Crosby couldn't field cleanly. "This win was big for us," said Jason Varitek. "The trade will take care of itself through time, but we still have other parts that we have to solidify; we have to pitch the ball well and play good defense. As we do that, it'll give our offense a chance to get going." Did the win bring mental peace? "I think this team has direction right now," Varitek said. "We have direction on what our team is and where we need to go." discuss Does this change your opinion of the trade? discuss A little sad to see Manny go? discuss Will Jason Bay be a good fit?